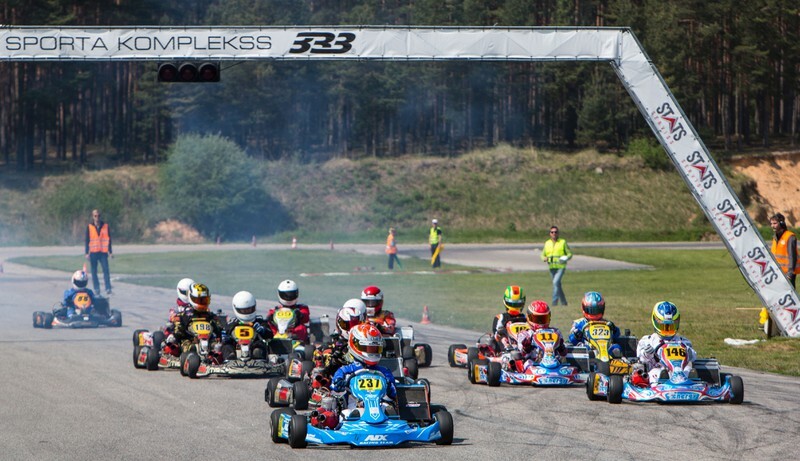 Already this Saturday, May 20, at Sport Complex “333” will be held the second race of the season 2017 - Latvian Karting Open Championship, Pro-Kart Cup and LMT AA Karting Cup second stages. Till the end of the week participants can register for race. It is possible to do on www.prokart.lv website, in the "Race". As well as, of course, the fact remains that all competition-related provisions can be found in the "Terms". 2nd stage of the season promises to be interesting and hot as well. Already after the first stage it was evident that many athletes are seriously preparing for the fight on the track from the first meters, delaying decisive results on the conclusion of the season. The weather on saturday promises even more this year, an unprecedented heat wave, so protecting yourself and others think about headgear, sunscreen and, of course, adequate water intake all competitions during the day. Information for fans, viewers and all other interested persons – this event are free of charge! It should be noted that the registration of participants on saturday, the scrutineers and tire issuance, on saturday, will take place from. 8:00 to 8:30, in parallel from 8:00 to 9:00 will take place in the technical control (by class) and issuance of the tire. 9:00 will begin free training rides for all classes. In turn, will take place 8:30 shareholders' meeting. We remind you that participation in the meeting is mandatory. Participants stand opens on Thursday 18.05.2017 from 8:00. Participants Park site are granted only competitors. Space is not pre-booked. Organizers allocate them in the order in which players come to shed. As well as participation in the award ceremony is mandatory. The total planned length of the race is from 20.05.2017 from 8:00 pm. 19:00 pm. In case anyone has forgotten, then we want to remind you that the SK333 is the strict rules of site use - strictly forbidden to make holes in the asphalt pavement, as well as racing machines to be placed on PVC or similar material surface, the plain language speaking, tents not pieurbt to asphalt and below Karting have carpet. On this non-compliance provided for severe penalties, up to 300 Euro. All who want to keep up with the competition by correspondence, it will be possible to watch the live internet Sportacentrs.com - www.prokart.lv or www.sportacentrs.com website. Aside from the direct translation from the competition, and all race results online, as always, will be found here www.results.lv , While, after the race will be published www.prokart.lv homepage under the "Race". As well as the progress of the competition, participants views and behind the scenes invariably will be able to keep the finger on the pulse of our Facebook page www.facebook.com/Pro-Kart . As well, a reminder and a great reference for all athletes to inform about their outside Latvian upcoming matches and their results - Pro-Kart spokesperson Sabīne Leingarde / e-mail: sabine.leingarde@gmail.com / 28355507 or new LAF press officers - Kristīne Pavlovska / e-mail: prese@laf.lv / 28344187. Do not hold a candle under a bushel, because we really want to write about you, so that everyone knows how cool and talented athletes we have! We remind you that the results of background, a photo and video of the 1st stage of the season 05.06.2017 www.prokart.lv is possible to find the page in the "Race / 2017"